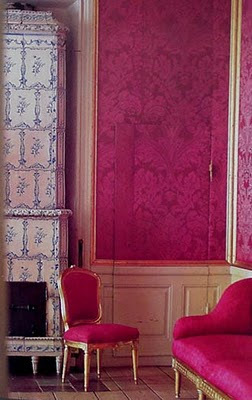 A silk diamond patterned Fabric of Deep Red - interwoven with velvet-like Dots - to Reupolster a French-style Chair. 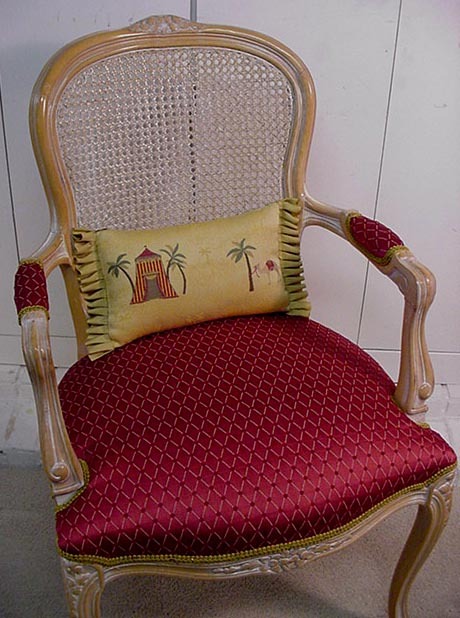 ﻿The Chair finished - Styled with a Silk Pillow that I made previously. While Reupolstering this chair - I started thinking about the Color Red. It's hard to be indifferent to Red - As bold splashes of primary Red are so invigorating - dramatic - attention-getting and full of Life-! I thought of Pre-Revolutionary Russia (as in Dr.Zivago Film) with candle-lit interiors glowing Red & Gold while the white Snow falls outside. I think the use of white as a contrasting color for Red - Creates a Fresh - Appealing - and cheerful effect - and prevents Red from being over-powering. 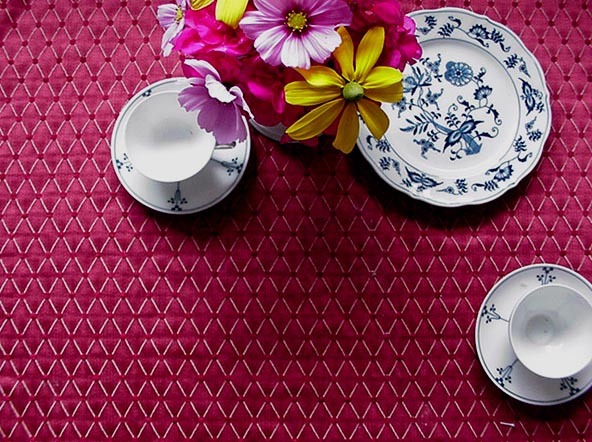 I thought of the prevelent use of Red & white Gingham - Stripes - and Ticking in Scandinavian Countries with cooler climates and long winters. Rich Red Damask Silk covers walls and furniture of A Classic Swedish salon - Softened with white molding paneling and a Tall blue & white Porcelain Stove. ﻿A Traditional Red in this Scaninavian Foyer - creates a warm and hospitable Welcome. 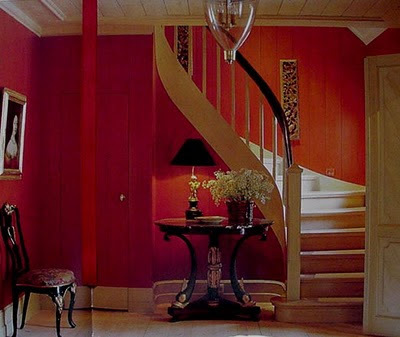 Again White Ceiling - floor - molding and staircase keep the Red tamed and clean-looking. the Black Ebonized Table & Chair add Drama. 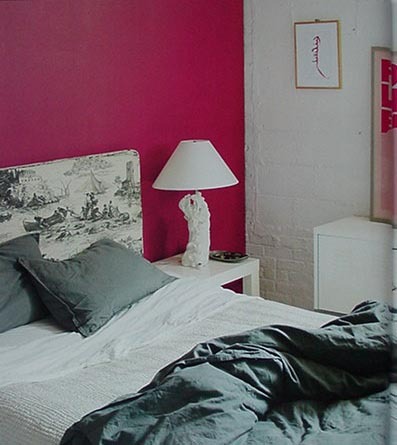 ﻿For a small space like this tiny white bedroom - just one wall painted Red (this one is: "Mai Tai" by Ralph Lauren) makes the room feel intimate at night and much more Happy in morning light. 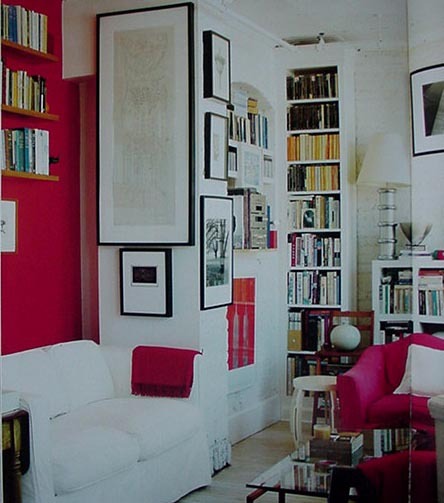 In a mostly white living room - White siipcovered sofa against one Red Wall looks graphic & Modern - but still warm and inviting.